OTTAWA - The Bank of Canada says it expects the oil-price shock likely "stalled" the country's economy to the point it had zero growth during the first three months of 2015 but that it has decided to keep its key interest rate unchanged at 0.75 per cent. The central bank justified Wednesday's rate decision by saying it expects positives in the non-energy sector to re-surface and the economic pain from the oil slump to fade. It predicted those improvements to show up in the form of more exports, investment and job opportunities." As the impact of the oil-price shock on growth starts to dissipate, this natural sequence is expected to re-emerge as the dominant trend around mid-year," the bank said in its latest, quarterly monetary policy report, also released Wednesday. The bank said it expects the Canadian economy to be boosted by the surprise quarter-point rate cut announced in January and to growing U.S. demand, which it predicts will bounce back after temporarily slowing in recent months. Its outlook for inflation, the key indicator behind rate decisions, is "roughly balanced." But the central bank warns the economy will first have to ride out the negative effects of the oil slump, which it says were even more "front-loaded" than expected for the oil-exporting country. The bank reduced it its first-quarter projection for Canadian real gross domestic product to "essentially no growth" from the 1.5 per cent prediction it made in January. "The bank now expects that the Canadian economy stalled in the first quarter of 2015," the report said. Last month, Bank of Canada governor Stephen Poloz told the Financial Times in an interview that the oil-price shock would make the economy's first-quarter numbers look "atrocious." In a March speech, Poloz also expressed concern about the second quarter: "We've got our fingers crossed." It said Wednesday that its now estimating the economy will grow 1.9 per cent for the full year, down from the January estimate of 2.1 per cent growth over last year. 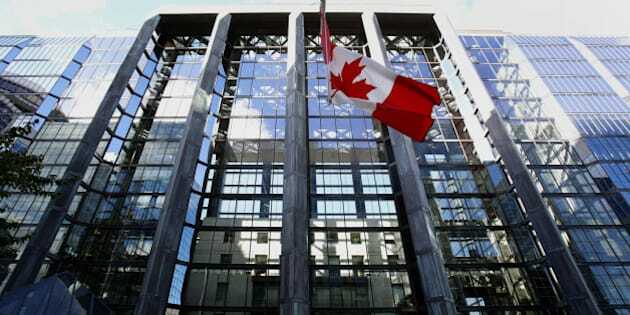 For the second quarter, which began April 1, the bank is estimating 1.8 per cent growth, up from 1.5 per cent in January. For 2016, it's predicting 2.5 per cent GDP growth next year followed by 2.0 per cent growth in 2017.The Bank of Canada said the continued volatility around crude prices means the "ultimate size" of the impact from the oil slump will have to be watched closely, though the magnitude of the economic fallout will vary by region. While crude-producing provinces, such as Alberta, Saskatchewan and Newfoundland and Labrador, will feel the brunt of the oil shock, a bank calculation also found other provinces will also suffer due, in part, to their connection to the energy sector. British Columbia and Manitoba will see modest declines in GDP, according to the bank. It also found that Ontario, Quebec and the Maritimes will see some losses in interprovincial exports to oil-producing regions, though they are expected to be offset by gains in other areas. This marked the second-straight policy meeting that Poloz stood pat on the interest rate since he blindsided markets in January by dropping the overnight benchmark a quarter of a percentage point to 0.75 per cent from 1.0 per cent.At the time, Poloz described the cut as insurance for the "unambiguously negative" impacts of sliding oil prices.He later credited improving global economic conditions as a reason for holding the rate steady at the next policy meeting in March, a move that left many analysts with the impression he wouldn't touch the rate any time soon. The long period of extra-low rates have stirred concerns about household debt levels.The report Wednesday said it expected income and wealth losses due to oil's tailspin to curb spending and borrowing — providing an offset to the cheaper available credit. On Wednesday, the bank reiterated its prediction that non-energy exports — with help from the lower Canadian dollar — would re-emerge and help make up for losses in the energy sector. Early signs that such as transition is underway have started to show up in the data, the bank said. The report noted that products categories expected to lead the sector's comeback grew at their quickest clip since 2000 in the first months of 2015. It underlined sectors including aircraft and parts, industrial and electrical machinery, and pharmaceutical products.